My week is off to an auspicious start. Though there are three full work days standing in my way, I have a big trip to Portland to look forward to later in the week. Yes, it's finally here -- my trip to Portland to take Heather Ross' fabric design class at the PNCA. I am equal parts excited and nervous. But at this moment, I can only worry about getting through the end of the workday on Wednesday. So there will be lots of exciting things to blog about in the coming weeks, but in the meantime I will leave you with a sneak peek of my project for the second issue of Fat Quarterly. I'm calling this pattern "Sanctuary". It's made from Valori Wells' new line, "Nest". And I LOVE it. For the first time ever, I had this quilt professionally quilted by a long arm quilter. I am SO GLAD that I did. I think I am officially converted. If you're looking for a quilter, I can't say enough good things about Bethany Pease. She came highly recommended, and I would gladly pass along that recommendation. 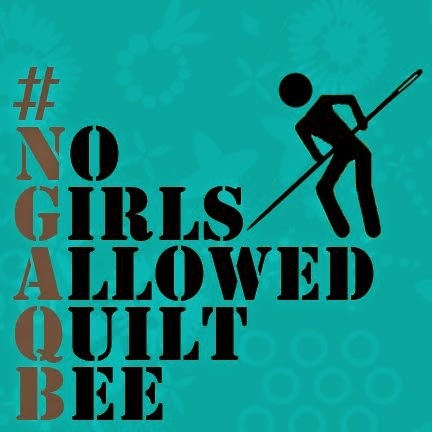 Check her out at her website, Bethany Quilts, and tell her that Quilt Dad said "hi"! You can get our second issue (featuring this pattern and many others by the uber-talented FQ crew) on Tuesday, July 27th. Oh my God is that ever beautiful! What an interesting design! And a beautiful quilt! Such a beautiful quilt! I can't wait for my Nest fabric arrive! Have fun in Portland, don't forget to go to Powell's books (an entire city block full of new and used books)! 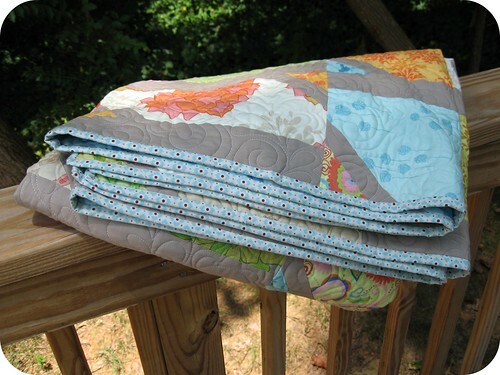 The quilt is lovely and the quilting has enhanced your design beautifully. Awesome John! I love the pattern. So excited to meet you in P-Town! Another fab design!! That quilting IS stunning, you must be so pleased. I can't wait to hear all about your design course. 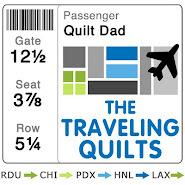 Have a great time...who else will you visit out there in the west coast hotbed of quilting bloggers? John, it looks amazing! Can't wait to get the details in the next issue of FQ! I LOVE this quilt! (Although, I love all of your quilts!) I'm dying to try the "off the grid" and now I have another to add to my list! Thanks so much for all the inspiration! Beautiful quilt with lovely quilting!! quilt looks great John! 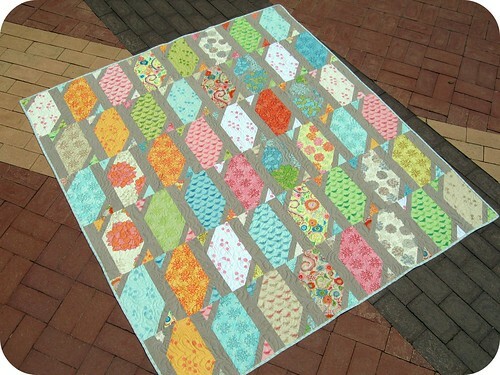 beautiful colours and the quilting does look fantastic doesn't it?! Beautiful quilt - and beautiful quilting. Have fun here in P-town - if you have time stop by Cool Cottons and Bolt Fabric. So jealous that you got into the class, but I'm hoping to attend her presentation on Friday evening. The pattern and the quilting are both amazing! Good luck at your class! I love the texture of the quilt! John, I LOVE that quilt pattern! Great job! Wow, that is a stunning quilt. I love the quilt! Love the pattern. The background fabric really looks great. That's a beautiful quilt John! Can't wait to see it in the next issue of FQ. That quilt is beautiful! I can't wait for issue #2. And I can't wait to hopefully get to meet you here this week! It is beautiful here right now! That is so beautifully quilted. The fabric colours combine fantastically as well. Beautiful quilt! Valori is one of my all time favs. Great choice on the sashing as well. I love this quilt! You are so talented. I am lucky to have such a talented brother-in-law. That is beautiful!!! The colors are amazing! I will be joining Fat Quarterly ...I love this pattern! Wow. That is a really beautiful quilt! Nice work! 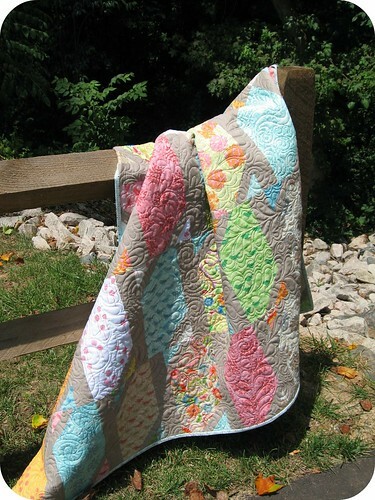 I am absolutely a fan of long-arm quilting... if only I had $15,000 for a machine! The quilt is beautiful! That is totally AMAZING. I want to link. Now that quilt makes me want to be a better quilter! It is gorgeous! what a gorgeous quilt, john!